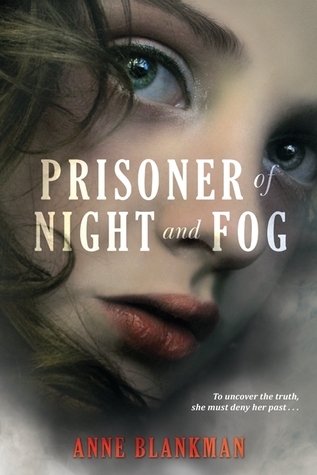 I decided to read Prisoner of Night and fog hot on the heels of Salt to the Sea, oddly wanting more of the World War II historical fiction I'd gotten a taste of. This is really strange behavior for me considering I usually stick to fantasy and dystopia, but I was intrigued by this book about Adolf Hitler's "niece." Admittedly, I don't know a whole lot about this time period, but I do love stories about people who learn the horrible truth about those they love. Luckily, I was not disappointed! Gretchen is a young girl whose family has become very, very close to Adolf Hitler following her father's death. She has always been treated as his beloved niece, shielded from the horrors of the Germany that is slowly unraveling around her amidst Hitler's rise to power. Gretchen only sees the best parts of her Uncle Dolf and has been fed sugar-coated versions of his plans regarding the "relocation" of the Jews. Despite Gretchen's naivety, I loved her character. Once the truth begins to reveal itself, Gretchen goes after it instead of hiding behind her wall of ignorance as so many would do in her place. Gretchen is strong in face of adversity, even going against her own family in pursuit of the truth and I thought she was amazing for it! This is YA historical fiction so there is obviously romance, but I found myself totally invested in it even though I didn't fully understand it at times. Daniel is a Jewish reporter who is looking into the death of Gretchen's father and ignites her passion for learning the truth. I didn't really get exactly why Daniel was interested in Gretchen's father's death, but I was honestly willing to overlook it because the bigger story was fantastic. Although Gretchen hates Daniel at first (what other choice does she have based on her upbringing, really? ), she comes to understand that he is just a person like her - the first chink in her armor. I loved the relationship between Gretchen and Daniel and the mutual respect that they held for each other. The villains in Prisoner of Night and Fog were despicable. Not only was Hitler the obvious bad guy here, but Gretchen's brother was also pretty terrifying. It was strange to see Hitler from the eyes of someone who loved him, but it was extremely interesting to watch his character devolve as Gretchen learned more and more about the man underneath the facade. I truly felt for her as her world crumbled. Speaking of Gretchen's world, the world building in this book was fantastic! I've said before that I really don't have much knowledge about this period in history (my historical interests are thousands of years earlier), but Anne Blankman did an incredible job of placing me right in the middle of 1930s Germany. I also enjoyed how the setting seemed to get darker and bleaker as Gretchen discovered more about Uncle Dolf. This is something that I've often seen done in films, but I feel like it is much more difficult to achieve on paper. The story itself - Gretchen discovering the truth about Hitler and her father's death, while realizing that the Jews were not villains - was interesting, if slow at times. It took awhile for the plot to really pick up, but throughout the second half of the book I was on the edge of my seat waiting to see what Gretchen would find out next and whether she and Daniel would be safe in the end. There was a lot of information and a lot of names thrown at me at times and there were terms I was unfamiliar with. I feel like a glossary may have helped this book a bit for the uncultured Americans like myself. Overall I really enjoyed Prisoner of Night and Fog! Sure, it had flaws. I felt like the way Gretchen and Daniel came together was a bit unbelievable, I was confused by some terminology, and it had a bit of a slow start. The good far outweighs the bad here though! Seeing Hitler's early years unfold from the viewpoint of someone who is essentially family was fascinating and the forbidden romance was fantastic! I definitely recommend this to those interested in WWII historical fiction and fans of Salt to the Sea!